petition: This Show Kills Animals on TV for Ratings. It Has No Business on TV. This Show Kills Animals on TV for Ratings. It Has No Business on TV. Survivalist and TV personality Bear Grylls has earned the name of the "Butcher of Bulgaria" after an episode of his series a survival skills/reality TV show "Running Wild." In each episode, Grylls invites a celebrity to join him on an adventure in the wilds of a new location. Bear then tests the celebrity's survival skills — and stomach — putting them through "real world" tasks they might encounter if they ever happened to get lost in the backyards of their million dollar mansions and have to find their way back without calling Uber. In his Bulgaria episode, Grylls and "Dancing with the Stars" dancer Derek Hough embark on an outdoors adventure in Rila national park. Rila is one of the largest most important protected ecosystems in all of Europe. It's considered a gem by the International Union for Conservation of Nature and is famous for its stunning views. It was here surrounded by this pristine nature, that Grylls and Hough caught several frogs and slaughtered them on TV. The idea was to teach Hough that everything you find in the wild can help you survive. But neither Bear or Derek was actually in any danger. They were accompanied by a film crew who undoubtedly had plenty of food and water to spare and transportation to help them get in and out of the park. Did the frogs really have to be killed? 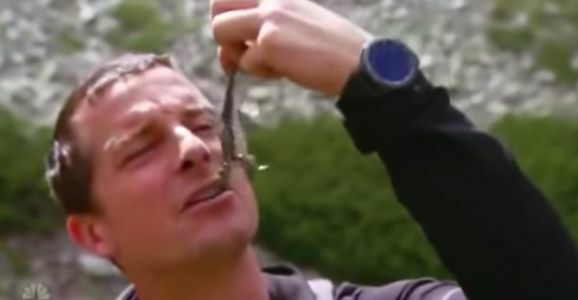 The Bulgarian government didn't think so and now they want Grylls to pay for needlessly killing the protected amphibians. This isn't the first time Bear has gotten into trouble for needlessly killing animals for the benefit of his audience. As mentioned by the Independent, contestants on his show " The Island" killed and ate a crocodile. One member of the show jumped on the croc's back and stabbed the wild beast through the neck. He's also been excoriated by legendary conservationist David Attenborough for his cruel stunts. It seems that wherever Bear Grylls goes, animals are in trouble. The unfortunate thing is that they don't need to be. Killing an animal to survive when you are lost in the wild is one thing. But killing them as a stunt for a TV show is wrong and unethical. Grylls, possibly more than anyone, should know that. Animals aren't props. Sign the petition and tell Bear Grylls to stop abusing animals!